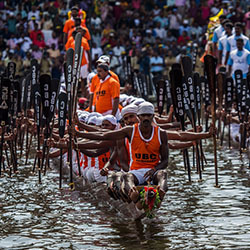 The Nehru Trophy Boat Race on the Punnamda Lake, near Alappuzha, held on the second Saturday of August every year, is the most competitive and popular of the boat races. On the day of this fiercely fought boat race, the tranquil lake front is transformed into a sea of humanity with an estimated two lakh people, including tourists from abroad, coming to watch the event. For the people of each village in Kuttanad, a victory at this race for their village boat is something to be celebrated for months to come. 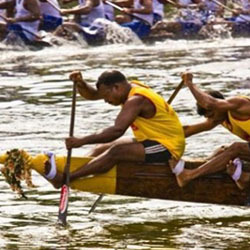 The major attraction of the boat race is the competition of snake boats chundanvallams or snake boats.Chundans (snake boats) are an impressive sight, measuring over 100 feet in length, with a raised prow. They were called snake boats by the former colonial rulers, who based the name on a native boat found in Norway,although Kerala's Chundans bear little resemblance to their European namesakes. The history of the Nehru Trophy Boat Race is associated with the visit of late Pandit Jawaharlal Nehru, the then Prime Minister of India to Alappuzha. He chanced a trip from Kottayam to Alappuzha by boat, through water logged Kuttanad. A pageantry of boats accompanied him on the trip.The first race was an impromptu once conducted in 1952 in honour of Panditji who visited Alappuzha.In that race of snake boats, Nadubhagam Chundan stood first. Panditji, who was thrilled and excited in the performance of the oarsmen, jumped into the Nadubhagam Chundan, forgetting all security arrangements.The boat proceeded to the boat jetty carrying the Prime Minister.On his return to Delhi in December 1952, Nehru donated a Silver Trophy, which is a replica of a snake boat placed on a wooden abacus.The trophy bears the following inscription above his signature. 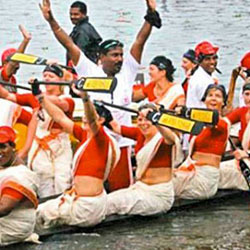 "To the winners of the boat race which is a unique feature of community life in Travancore Cochin." This trophy later came to be known as Nehru Trophy, and in fond memory of great Panditiji, the people of Alappuzha celebrate the Nehru Trophy Boat Race every year. A beautiful golden 'Mandapom' under the Manro lamp at Aryad. It is exquistely decorated. Artistically laid up seating arrangements and a temporary platform and pavilion are set up. The Vembanad Lake in front of the Mandapom. Eight tracks, each of 30 meters width marked in the lake. Bamboo poles laid in the one mile long distance for this. Special boats, motor launches and big county crafts in line. The sons of Kuttanad are in ecstasy. Everyone glanced and every finger pointed to a distance." Dorothy", the special boat approaches majestically causing flutters in the lake. The atmosphere gets filled with loud cheers. The boat moves on and on aiming the 'Mandapom'. The esteemed Chief Guest, clad in Churidar Pyjama-Kurtha, Gandhi cap and wearing pathan Shoes down near the Mandapom. Panditji Ki Jai Deafening cheers from thousands. The architect of modern India, Pandit Jawaharlal Nehru, India's first Prime Minister raised his hands to receive salutations. The guns boomed 63 times to mark Nehru's age. The office-bearers garlanded the Prime Minister, who got seated in the Mandapom with his characteristic, charismatic smile. Panditji liked specially the garland made of Paddy grains. Indira Priyadarsini who was with her father was given a casket made of paddy grains. Her children were presented with bouquets in the shape of paddy bunches. It is time for the race. A great boom is heard. Eight snake boats (Chundan Valloms) darted forward in lighting speed, marking the beginning of the race. Pandit Nehru watches the spectacular sight through the binoculars. Like a child who cannot control its ecstasy, he jumped up and down. He was greatly thrilled. As the race boats neared the pavilion, the esteemed guest got on his chair. "There .. Comes .." , said he, holding his grand-children Rajeev and Sanjay. As the waves of joy dashed in the little minds, Nehru asked his daughter "Indu, can u see well"? She nodded. The boats were nearing the finishing point. The sight of equal forces vying for supremacy was a sight to be watched. The mind boggling affairs made Nehru forget himself. He began dancing to the rhythm of the paddlers. The banks of the lake were immersed in loud clapping. The rhyme and rhythm of Vanchipattu (Boat songs) filled the entire atmosphere. 'Nadubhagom Chundan' in unbelievable speed crossed the finishing point and hoisted the winner, flag on the boat. 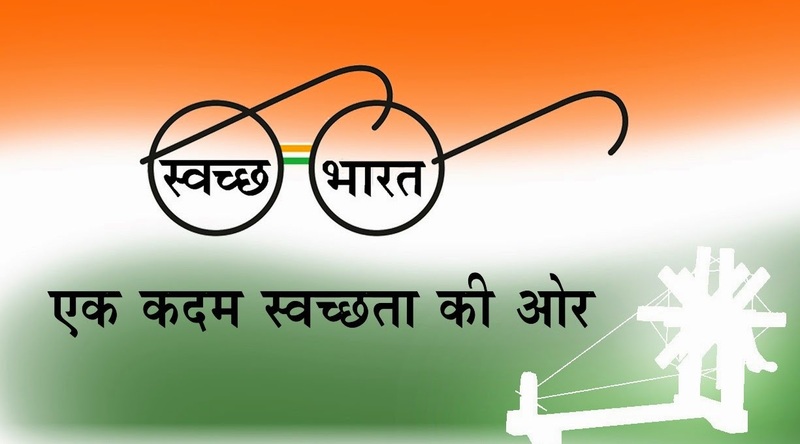 The then District Collector Kerala Varma announced the results of the race over the microphone. The captain of "Nadubhagom", Mathu Chacko received the special prize from Panditji – the rolling trophy made in pure silver, in the shape of a snake boat. The trophy costing Rs.1000/- , then raised the prestige of 'Nadubhagom Chundan'. The Captain of all the boats received some prize or other from Jawaharlal Nehru. After the race, all the Snake boats were going towards the Alappuzha boat jetty. While nearing the VIP pavilion, the oarsmen displayed their talents besides there immense joy. The sight of the long row of snake boats with the routers inside it enchanted Nehru. He tried to jump into the Nadubhagom Chundan as the boat reached very near to the pavilion. The then home Minister of Thiru-Kochi, T.M.Varghese tried to dissuade him saying, "It will be convenient to go in a mechanized special boat". "No, Mr.Varghese let me be in the snake boat for five minutes. You don't have to be afraid", said Panditji. Not wasting time, Pandit Jawaharlal Nehru jumped into the Nadubhagom Snake boat. His grand children who wanted to follow suit, were dissuaded. "You may come with your mother in the special boat, he said. In spite of Nehru's protestations, the security officer jumped into the Snake boat. A pleasure trip was made by Pandit Jawaharlal Nehru standing inside the Nadubhagom Chundan, in accompaniment of other snake boats. The waves of Punnamada rolled on her beams. Emotional deluge filled the atmosphere as India's Prime Minister, oblivious of everything else, enjoyed the trip. This marked the beginning of the greatest water sport in the world. The colourful Boat Race was first for the "Prime Minister's Trophy". Later, it came to be known as "Nehru Trophy Boat Race". The Nehru Trophy Boat Race can rightly be called "Kuttanad's Olympics on water", the national festival of the people of Kuttanad. This is held every year on the second Saturday of August, at the palm-fringed, picturesque Punnamada Lake, Alappuzha, Kerala, 'God's own Country'. The 8 Snake boats participated in the procession were, Nadubhagom, Chambakkulam (Amichakari), ParthaSarathy, Kavalam, Valiya Diwanji, Neppolean, Nethaji, GearGoss (I.C.Vallam). The boat race was conducted at the west corner of Vembanadu lake from west of Mantro Light at North towards south. Starter was Sh.E.J. Luckose, Physical Director, CMS High School . Chief Judge was Sh.Kurien John, Thazhathangady. 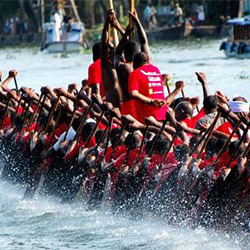 In 1952, The Boat race was conducted by the District Collector, Kollam, since Alappuzha district was not there then. 1954, Boat race was conducted as Prime Minister's Trophy at Meenappally Vattakkayal, Kainakary. 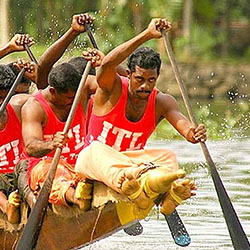 Since 1955, the Boat Race is conducted at Punnamada Kayal. The island pavilion was built in 1970. The race courser having a length of about 1370 meters is divided into various tracks for the conduct of the competition. When they are advancing through various tracks, it appears like the fast moving snakes. The oarsmen splash the oars in unison with the rhythmic chants and beats of drums. The movements of competing boats are so thrilling that the spectators get a tune with the excited mood of the surrounding uproars.The festival begins with a procession of the snake boats. The snake boats and the smaller varieties of Kerala race boats like the 'Churulan', 'Veppu' and oadi' move in a formation down the 1.4 KM stretch of the lake as the sturdy villagers, their biceps rippling in the sun, row with an elaborate flourish of the oars to the singing of couplets from "Kuchelavritham Vanchipattu" the classic Malayalam poem written by Ramapurathu Warrier to regale King Marthanda Varma of Travancore in early 19th century during a boat journey from Vaikom to Thiruvananthapuram. The numerous beaded umbrellas held aloft in each boat, the gilded sterns of the ebony black snake boats and the changing patterns that the rowers weave with their oars transform the lake into a kaleidoscope. Floats giving glimpses of Kerala's rich cultural heritage follow the race boats, with artists performing "kathakali" "theyyam" "panchavadyam" and "padayani". And then a quiet falls on the lake front, broken only by the sound of ripples lapping the embankment and the rustle of palm leaves in the wind. The snake boats line up at the starting point for the great race. As the starter's flag goes up, the scence freezes into a tableau the rowers tense with their paddles poised, the pace keepers alert and the steersmen straining against their long oars. The flag falls in a blur and suddenly the thumping begins. The crowd erupts into a roar, birds flutter up from their perch on the trees and the snake boats hiss their way down the lake in a haze of spray, fighting a pitched battle in the dappled waters. "Ayyo-poyye… ayyo-poyye" – the cadence grows to a crescendo as the oars dip and flash 100 to 120 times a minute and the steersmen hurl their gigantic oars in a high arc. Preparations for the big event begin several weeks in advance. The snake boat is smeared with sardine oil for smooth passage through water, the best oarsmen are selected and, under the supervision of the senior most oarsmen, the practice sessions begin. Around 150 oarsmen, who would represent the village, take the vow to observe strict abstinence and celibacy till the oars to each of them. Each ward in the village and at time rich individuals takes their turn in feeding the athletes on the days of the practice at mass feasts on the river banks. Even in the days of untouchables, this was a feature of the regattas with caste Hindus, Scheduled Castes, Christians and Muslims sitting in the same row for the feast symbolising the communal amity in Kuttanad. In fact, the Church has a traditional role in the celebrations at Champakkulam though the water festival there is associated with a temple legend. Track length – 1400 M.
4 tracks of 10 M. wide from East.